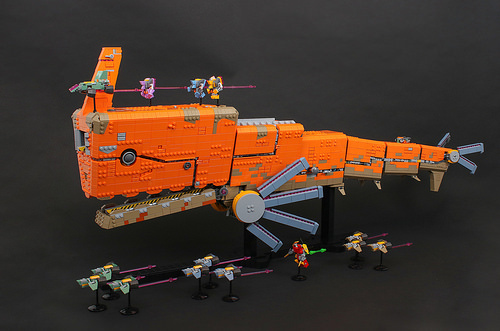 Called the Celestial Barracuda, this marine-inspired vessel by LEGO designer Niek Van Slagmaat (most recently of 21311 Voltron fame) is one of the more uniquely designed spaceSHIPs of recent memory. Traversing the inky deeps of space and reality as an interdimensional transport ship, the ship takes the form of a sinuous fish. Niek expertly strikes a balance between placing tiles for a smooth exterior and strategically leaving studs exposed to create a textured, weathered hull. He’s also used a sprinkling of dark tan among the orange bricks, highlighting where the orange paint has peeled over eons of space travel. 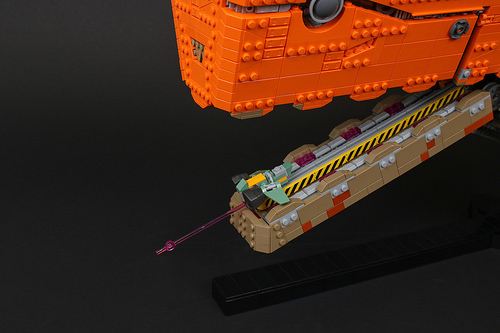 The ship’s fish-like features aren’t just for show, though, as they serve a more utilitarian purpose in supporting the small fleet of nimble craft that surrounds it like pilot fish. 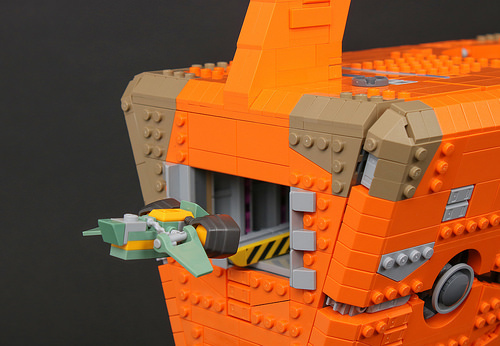 For instance, the lower jaw is actually a starfighter runway for returning craft. For launching, there are several hatches around the ship, such as this bay at front. Here we can also see the care with which Niek has designed small ships, too. Holy crud! That’s a lot of Quay Tolsite helmets!! Must have cost a fortune!